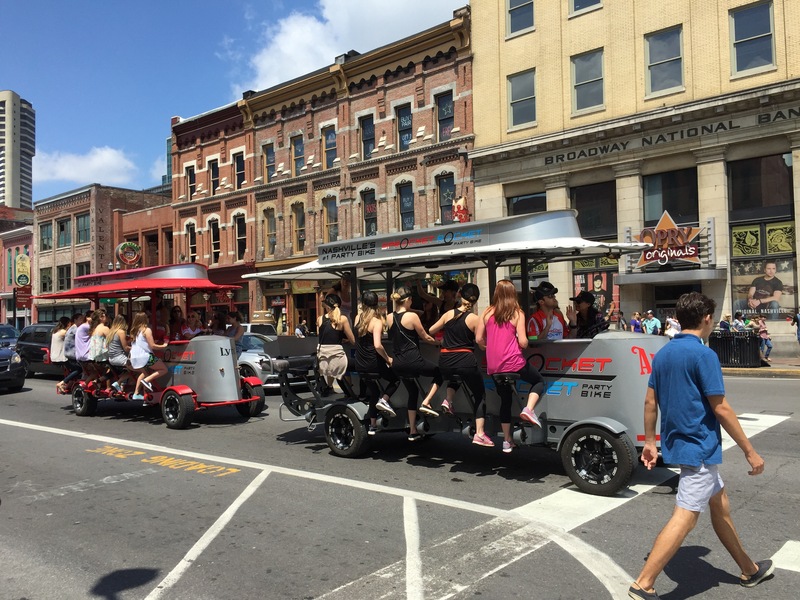 Nashville must be the top bachelorette party destination east of the Mississippi. You see the bachelorette groups everywhere — pedaling together to power the bicycle bars heading down Broadway, slamming down Jell-O shots, singing along with the band at the Honky Tonk Saloon, and whooping it up on the sidewalk — and always smartly attired in matching shirts and hats with clever slogans about love or being drunk, and sometimes both. As soon as one group leaves, another bachelorette band arrives to take its place. 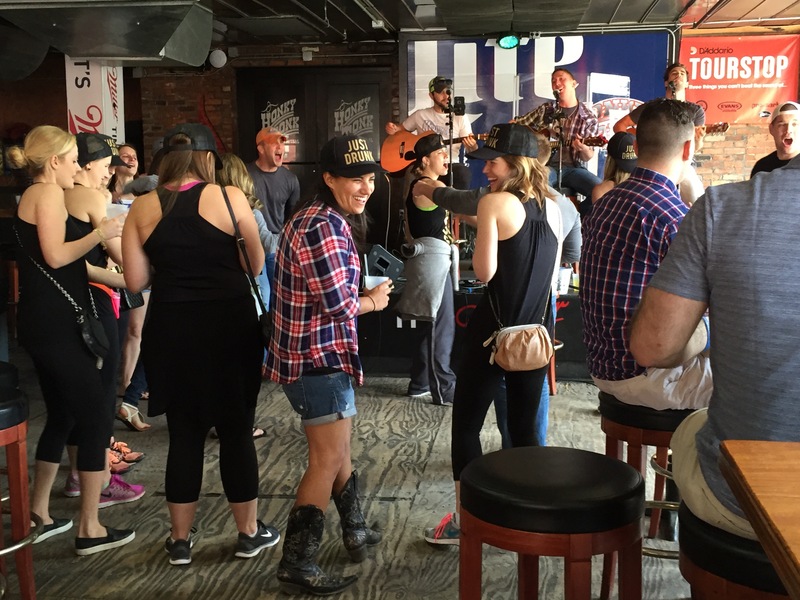 Why is Nashville such a popular bachelorette destination? Well, why not? It’s got lots of saloons and live music and drink specials and pedal bars and all of the features of a modern bachelorette fantasy. And let’s just say that the ladies we saw were taking full advantage of the chance to cut loose, starting bright and early and hitting it hard. They were having fun in the bride-to-be’s last hurrah. I’m guessing that what happens in Nashville stays in Nashville. 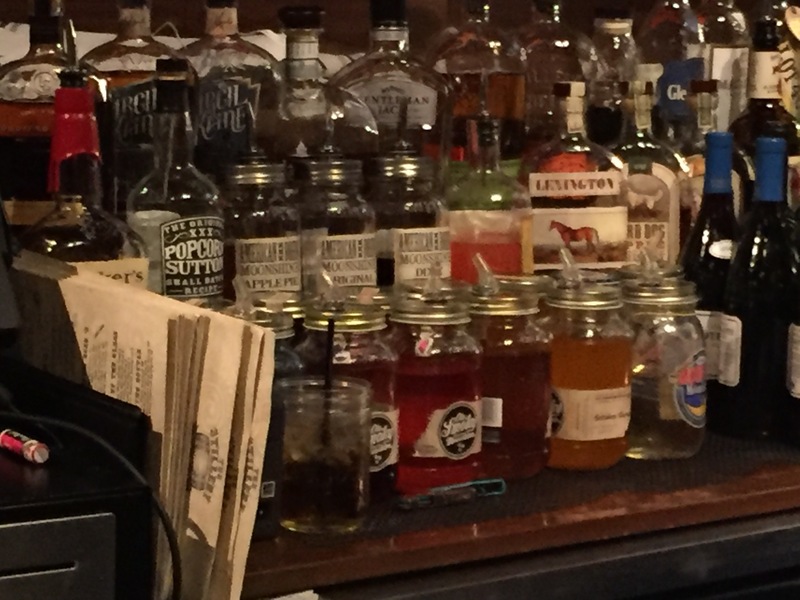 The bar where we ate dinner last night was very well-stocked, but I paused for a minute at the serious collection of jars — until I realized it was all moonshine. Well, we are in Tennessee, after all, eating in a place called The Stillery, and there wasn’t a revenuer in sight. The moonshine came in lots of different flavors, like “apple pie.” I’m sure many party-hearty visitors to Nashville have figured they should guzzle some shine to make their visit fully authentic . . . and then came to regret it the next morning. I wasn’t tempted. In college I learned my lesson well that drinking fruity concoctions where the Kool-Aid-like flavoring serves only to mask the crushing alcoholic content isn’t a wise course of personal conduct — especially when it’s served from what appears to be a garbage pail. With an inward nod to Granny Clampett, I let the white lightning pass and stuck to a beer. For the last few years, Kish and I have stayed up late exactly one time each year: the night of the firm’s holiday party. Because we want to maximize our opportunity to visit with everybody who comes in for the party, we get a room at the hotel, stay until the party and after-party end, and then head over to the Char Bar next door until it kicks everybody out. That happens at 2:30 a.m., which is far, far past my normal bedtime. But somehow, on this one night, that doesn’t seem to be a problem. For me, at least, it’s much easier to stay up if there are a lot of people around and interesting conversations to be had. It’s all about your state of mind and a little careful preplanning and pacing. You make sure you eat and establish that crucial base, you start with wine and then step down to beer rather than powering down mixed drinks, and you make sure that rather than sitting you’re on your feet, taking advantage of the chance to move from group to group and chat with friends. The next thing you know, they’re rolling the bar away, you check your phone and it’s much later than you thought, and it’s time to move on. The Char Bar is a good place to end up after a long night. You’ve got your regulars, you’ve got the tipsy, weaving patrons who’ve had a few too many Long Island Iced Teas, and then you inject a late-night invasion of suit-wearing men and shiny-outfitted women. It makes for an interesting mixture, and you can play darts, too. It’s easier to stay alert when you are hurling sharp objects. 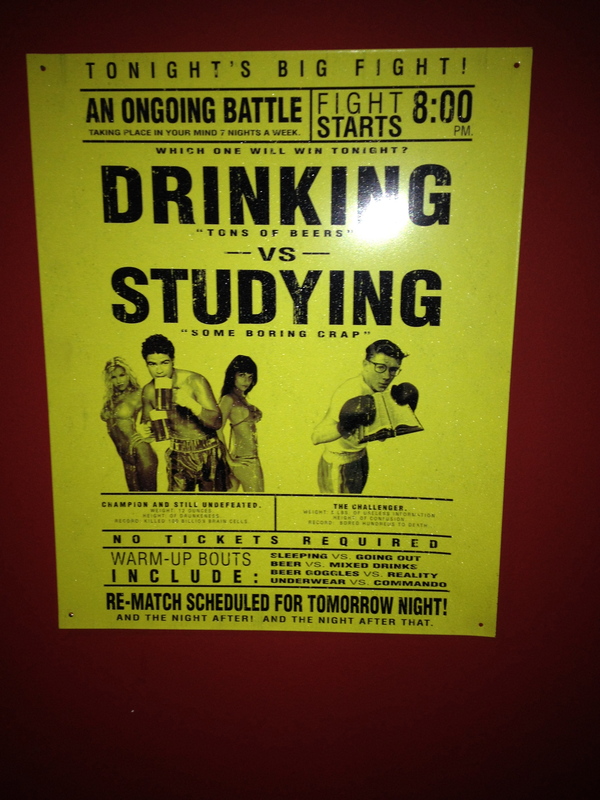 This sign, posted in one of the establishments we visited during our German Village pub crawl last night, made me laugh. Some things never change! And in case you’re wondering, the undercard bouts before this titanic Main Event include Sleeping vs. Going Out, Beer vs. Mixed Drinks, and Beer Goggles vs. Reality.